I thought it would be fun to start a new blog series here every Sunday! Featuring #KellieStamps by Kellie Winnell! This is going to be a creative series to help you find new ways to use your digital stamps. 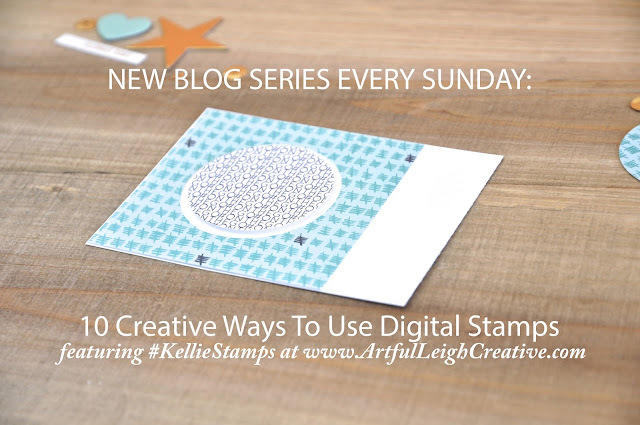 We will be focusing on the different techniques each Sunday using Kellie Stamps. Don't you love that you can create any size, color, and orientation with digital stamps? I still stamp in person, but I love adding this set of skills to the crafty bag! As you can see above in the photo, adding foam tape under your punched piece really makes it a focal point of the card, and gives you that true hybrid scrapbooking result. You can really create any card for pocket scrapbooking, like Project Life®, or scrapbooking you would like. I need help with the program /software part. I have photoshop.